Clint believes in a focus on leadership enhancement. 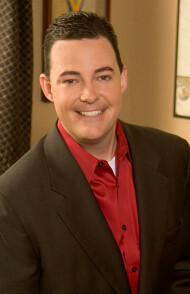 His solutions include leadership development programs, training, speaking and general consulting. As a professional speaker, Clint travels the world delivering high-content speeches and training in an entertaining and inspirational style to Fortune 500 companies, government agencies, and trade associations. His clients include 7-Eleven, American Express, BMW, Hallmark Gold Crown, Valero Energy Corporation, Enterprise Rent-a-Car, and Uno Chicago Grill. 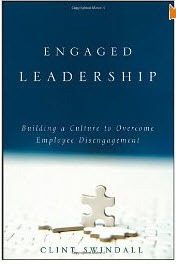 Clint Swindall enjoys the challenge of enhancing employee engagement for his clients by delivering programs based on his book entitled Engaged Leadership: Building a Culture to Overcome Employee Disengagement (John Wiley & Sons, 2007). He recognizes that a culture of employee engagement is a two-way road, and that true engagement comes when leaders and employees are both doing their part. 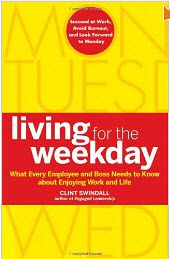 In addition to working with leaders to build a culture to overcome employee disengagement, Clint addresses the employee’s role in his follow-up book entitled Living for the Weekday: What Every Employee and Boss Needs to Know about Enjoying Work and Life (John Wiley & Sons, 2010). He is the recipient of the Certified Speaking Professional designation. Less than 10% of speakers worldwide who belong to the National Speakers Association and the International Federation for Professional Speakers hold this designation. As a professional speaker, trainer and leadership consultant, he has delivered his programs throughout the United States, Canada, South America, Mexico, Bermuda, and The Bahamas. Clint Swindall offers a range of topics to enhance the quality of leadership within your organization. Research indicates that less than one-third of employees are truly engaged. The vast majority of employees simply show up to work each day prepared to do the minimum to get by. This problem of employee disengagement is a source of ongoing frustration for leaders of any organization. We live in a world of disengagement. According to The Gallup Organization, three out of four people are at some level of disengagement in their life. The people in this group have chosen to see their work as a necessary evil to survive. The result is often an entire career waiting for time away from work. They’re waiting for vacation. The ability to bring generations together is one of the single most important factors for business success in the new millennium. In order to achieve cooperation between the generations in the workplace, understanding the reasons for the differences and knowing how to respond to these differences will determine the level of success. These are tough times for many people. The global economic crisis has created anxiety for friends, family, and co-workers who have been affected directly or indirectly. If we can’t find enough negativity in our own world, the media provides a steady diet of negative information. "We all have 7 days . . . "
clock. They simply show up to work prepared to do the minimum to get by. Whereas engaged employees challenge those around them to do more and better, disengaged employees demoralize the productive employees with their lack of passion and intensity. way street; no program works without employees stepping up and participating. If you're a leader, this participation is the key to your team's breakthrough results. for more life satisfaction and career advancement.